In the past few weeks I have published pieces looking at five defenders and five midfielders to watch in 2018. This will be the third and final instalment of that series as we look at five young attackers to watch. Once again I will offer a disclaimer before I start, this is a purely subjective list of young, talented attackers that have caught my eye over the course of the first half of the season, whether when watching match footage or checking statistics from various leagues. The five attackers are not ranked in any specific order and do not fit in to one particular role, instead we have two players who should develop in to out and out number 9’s, two pacy wide attackers and one player who is a hybrid of the two. Read on if you want to find out more. Previous generations of German football had developed a reputation for producing and developing genuine attacking talent. From the likes of Fritz Walter in the 1950’s through to Gerd Muller in the 1970’s through to the duo of Rudi Voller and Jurgen Klinsmann in the 1990’s. Since then however the well appears to have run dry. Players like Miroslav Klose and Mario Gomez have exceptional goalscoring records without being considered exceptional players whilst Thomas Muller is more comfortable in a wider or more withdrawn role. Now though a youngster has emerged at Hamburg who may well prove to be the answer for the national team in years to come. Jann-Fiete Arp was not expected to make a significant impact on the first team this season at Hamburg, that is until the club struggled through the opening weeks of the season. So far he has played 578 minutes over 9 matches for the first team scoring twice in the process. More than just the goals though it is the quality of link up play and game intelligence that has impressed from the youngster. At 18 Arp is already around the 6ft2 mark although his slight frame should gain more mass and muscle as he reaches his 20’s. For all that he is slender however he is not easy to move off the ball when in possession. He also possesses an excellent feel for space around him as well as the technique required to control and manipulate the ball in tight areas. After impressing for the German national team at various youth levels is appears to be a matter of when and not if he is given a chance with the senior national team. Here we see Arp scoring one of his first team goals and we get an appreciation of his ability to manipulate the ball and attack space. Arp is isolated in the width of the penalty with two other supporting players maintaining wide positions. As the ball is played in to his feet he has his back to goal and is closely shadowed by the defender. Arp however uses the close position of the defender to his advantage by rolling his man and progressing in to the penalty area. Before the covering defender can come across Arp has already stepped back inside on to his right foot and finished low in to the bottom corner of the goal. Here we see the game intelligence and anticipation of Arp. 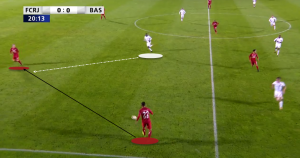 As the opposition defender in possession of the ball is being pressed in the wide area Arp reads the possibility of the pass back to the goalkeeper. The man in possession has two defenders sitting on a deeper line but passing to either would leave that man under pressure. Instead he plays the longer angles pass back to the goalkeeper and Arp is quick enough to close the space down and intercept the ball leading to a clear goalscoring chance. The future for Arp at club level remains unclear, there is no doubt that he will benefit hugely from sustained exposure to first team football. Whilst he may well get that at Hamburg the chaotic nature of the club over the last few years may mean that he has to move on for the stability. If he does decide to switch clubs at some point in the near future then there is no doubt in my mind that the giants of German football will be at the front of the queue. Hassane Bande is a young attacking wide player who has made a significant impact in his short time in European football. He only moved to Europe at the start of the season moving across to Mechelen of Belgium from his first club Salitas in his native Burkina Faso. Since then Bande has played 1229 minutes over 17 matches for his new side, In that time he has scored 8 goals and registered 1 assist, this means that Bande has been directly involved in a goal every 154 minutes of play. Unfortunately for Mechelen and fans of Belgian football these performances have not gone unnoticed and towards the end of 2017 we saw Dutch giants Ajax agree a reported €7.5M fee for Bande to join them at the end of the current season. What kind of player will Ajax be getting though? Hassane Bande is an attacking player in every sense of the word, comfortable playing across the front line either in the wide areas or centrally where he can lead the line or play off of a fixed striker. His mobility and ability to use either foot comfortably makes it difficult for defenders to predict what he is going to do, add to that his obvious end product and you have an attacking player whose potential is undoubted. There are still times when his inexperience at this level shows and his decision making skills will develop over time but his ability to bring others in to play or knit together the attacking movement of the team. Here we seen an example of Bande playing from his favoured left sided position. In the first instance he has drifted in to the half space to collect the ball. As he picks up possession he immediately looks to engage and attack the nearest defenders. In this instance he drives in to the central area and dribbles past two defensive players. It is at this point however that the ball has to be used well, instead of trying to do too much on his own Bande identifies the space behind the defensive line and is able to play a well judged through ball to his team mate moving from the right hand side. This time we see the quick feet and movement from Bande. Mechelen are looking to move the ball forwards in transition. When the ball is first played up to Bande he is being pressured by a defender behind, Bande is creative enough to quickly flick the ball with his heel to a central supporting player before spinning his marker and moving in to space. He is then free to take the return pass and attack forwards in to space. Rennes are a club that are well known for talent identification and and development within France. As a smaller club that traditionally do not challenge at the top end of the table it is remarkable that they are able to keep developing and selling their most promising assets before restarting again with more young players moving in to their first team. The most notable example in recent years is that of Ousamane Dembele who left the club in 2016 to move to Borussia Dortmund before moving again to Barcelona in 2017. It was at the start of this season that Rennes finally identified a replacement for Dembele and signed Ismaila Sarr from Metz. The Senegalese wide player has a similar profile to Dembele although arguably his ability is still at this point more potential than anything else. Sarr is without doubt the most raw prospect on this list but with the right development he could go on to become an explosive attacking player. Although Sarr is able to play on either the left or the right he is more comfortable starting from the right hand side and cutting in towards goal. Quick feet and great acceleration make Sarr a terrible prospect for opposition defences. Here we see the type of movement and improvisation that makes Sarr so difficult to defend against. As he picks up the ball centrally he is equally comfortable using either his right or left foot to manipulate the ball, He drives centrally and leaves the closest two defenders training before forcing the covering defender to move out to engage the ball. As the defender makes this move towards the ball the passing lane to the wide player moving in to space opens up and Sarr is able to bring him in to play easily. This is an example of Sarr in one of his most dangerous positions. Pulling off the shoulder on the blind side of a fullback Sarr has the pace and desire to get on the end of any through balls that are played through the channel between the central defender and the fullback. The other two parts of this series have featured players from the Red Bull stable and this one will be no different although Dimitri Oberlin is currently on loan at Basel in his native Switzerland. Oberlin was signed by Red Bull Salzburg from FC Zurich before spending time out on loan to SCR Altach. At the start of this season Oberlin made a more high profile loan move to Basel in order to increase his development. Given the level of his performances so far this season though it is looking increasingly likely that Oberlin will return to his parent club at the end of this season. A forward player with the profile to fulfill a number of different roles we may well see Oberlin eventually develop in to a traditional striker with the capability of drifting out in to wide areas to pick up possession of the ball before moving to attack centrally. He possesses genuine pace and when running from deep areas in to pockets of space he can be near impossible to stop. There is still an element or rawness to his game but as he gains more experience these should become less of an issue. Here we see the benefit of Oberlin’s pace in the defensive phase. As the man in possession is about to be pressed in the wide areas he will look to turn the ball back in an effort to recycle possession of the ball. Despite the distance between Oberlin and the receiving player the forward has the pace to male up the distance and be in a position to challenge for and win the ball before it can be passed again or cleared from danger. Here we see the danger of playing a high defensive line against a player like Oberlin. Basel are attacking in a quick transition and as such the defending team have been unable to set their defensive structure. As the player in possession of the ball cuts inside there is a single defender who finds himself isolated from any defensive support on a deep line. With the pace of Oberlin any angled pass in to the space between the penalty area and the goal is likely to result in a goal and this is no exception. Oberlin comfortably bursts on to the ball and has the composure to finish calmly when moving at speed one on one with the goalkeeper. Next season should see him start at Red Bull Salzburg although given his physical profile I would not be surprised to see Oberlin make the move to RB Leipzig sooner rather than later. Lyon are a club with a fantastic record of producing young players throughout the years, the last truly world class forward to come through from the clubs academy however was Karim Benzema. There are high hopes around the club however that they may have finally found a player to replace the French international in Amine Gouiri. To this point Gouiri has had limited exposure to first team football although he has shone in international competition for the various youth sides, with the signing in pre season of Mariano the position of first choice forward has been filled but over the course of the second half of the season I fully expect to see Gouiri get more first team minutes. A more traditional striker than many of the others on this list the strengths of Gouiri’s game lie in his ability to play off the shoulder of the last defender to find pockets of space that he can exploit and move in to. A clever finisher who shows remarkable composure for a young player there is no doubt in my mind that Gouiri will develop in to a player who scores a number of goals both at club and international level. Here we see Gouiri in the central attacking area moving around the defensive line in order to maintain an onside position. 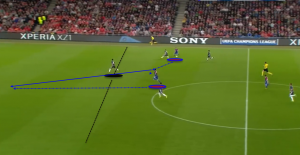 Eventually as the ball is clipped over the top in to the space between the defence and the penalty area and the timing and angle of the run from Gouiri is perfect to enable him to collect the ball for a one on one opportunity. Here we see Gouiri as both the link player and the finisher of this move, First of all he provides an angle to support the man in possession of the ball and plays a quick and perfectly weighted one two to allow the man in possession to move further in to the penalty area. At this though Gouiri does not stand still and instead spins in to space to get in to the central area where he receives the cut back for a simple finish. The first step for Gouiri will be to establish himself in the match day squad at Lyon before breaking in and getting minutes of first team action. After that we should see the player go from strength to strength.